First impressions of the Tyranid codex? Thin. I always thought that 40k was big on background, but even with a few pages of fluff the book seems to compare poorly with my fantasy army books. Even so, there is a surprising amount of options available to virtually each troop. I was intending on starting with the battleforce, the contents of Battle for Macragge and some old models rescued from an old copy of Tyranid Attack. I even did a fair bit of research online, looking for inspiration for colour schemes. But for some reason, I am just not fired up about the project. My original choice of Space Marines seems much more interesting. I had discarded the idea because of other players choosing this army, but I'm not sure that's a valid way to make a decision. What to do next? As this blog develops, I will slowly be posting pictures and ramblings on all my armies (there's about six or seven of them, last time I counted at least). Here's one of the smallest and most pathetic of the bunch, the night goblins. Well, here's the latest addition to the "horde", the army standard bearer. There's more pictures of the army on my website. 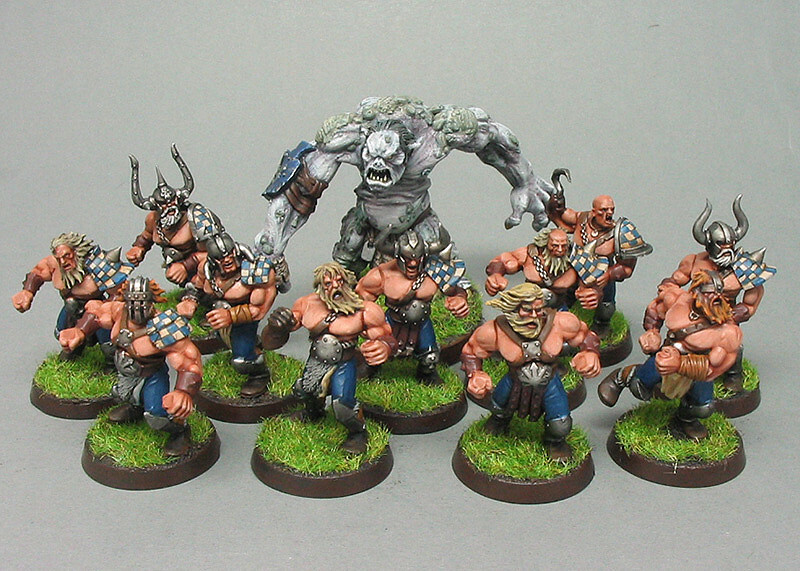 The army started out as an obvious opponent to my dwarf army and was originally based around the contents from the Battle for Skull Pass box set. It's expanded as time has gone by, as these projects tend to grow organically and in fits and starts, depending on what I feel like painting at any one time (and which models I can pick up cheaply on ebay). There's a good 500 points of painted night goblins, with another couple of units based and ready for paint. 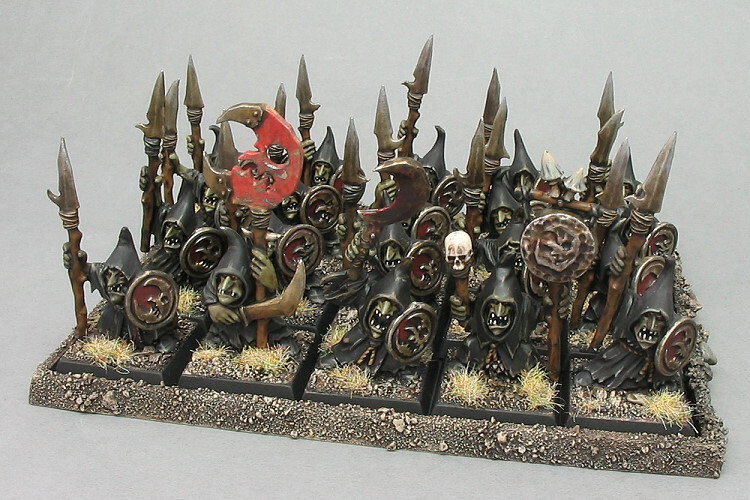 It will make a nice little 1000 point army at some stage, or as support units in a bigger greenskin army. A new project is slowly forming in my ever expanding to do list. Definitely a first for me, it's a pink army! I had mixed feelings about the new daemon book. 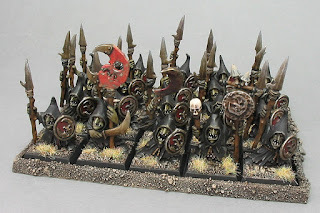 As a long standing chaos player I have always enjoyed the freedom of choice by mixing mortals and daemons and even the odd beast regiment into my armies. Officially, those days are over (though I suspect in my gaming group we will continue to allow daemons into mortal armies, etc). So I was wondering what to do with my few daemon regiments, even contemplating putting them up on ebay. In the end, however, I was rescued from this miserable prospect by a most unlikely person. My wife! She really likes the new daemonette models and has always had a soft spot for the little guys in the game (snotlings, gnoblars, nurglings and the like). It was her idea that I paint a small daemon army for her, comprising all the lovely pink and lilac models in the army book. That's daemonettes, fiends and nurglings. Nurglings? They should be green shouldn't they? Not any more. I will also be able to add my already painted horrors and screamers, and I should be able to make something out of my old school fiends. Throw in a suitable herald of Slaanesh and a pink and blue army is born. It will be roughly 1000 points, but I can add some Khorne troops to it if I want to use it for my usual 1500 point games. In fact, I might even be tempted to add a Keeper of Secrets for the occasional 2000 pointer. I just need to find some space in my glass cabinet. The Norse team is well and truly finished. In the end I decided that the shoulder pads definitely needed the injection of the colour, hence the check design. Apart from that, the painting has been very basic and speedy (recipe coming soon). The players are designed to be easily distinguishable, even if at first glance they are all marauders with no axes! The thrower has a glove, the runner is stripped of his armour to improve his speed. The two berserkers have orange hair and masks over their eyes (to keep them relatively calm). The ulfenwerer are the oldest, most experienced players and thus have grey beards and the best helmets. The rest are linemen. Hopefully they will be enough for the season, though I can always add 2 or 3 more at a later stage, if need be.